Charity Navigator is an online platform that objectively evaluates non-profit organizations. The site reviews thousands of charities’ financial documents and support causes in order to develop a non-biased, number based rating system. Charity Navigator aims to provide accessible data to guide informed giving by individuals and corporations. Learn more about the organization’s mission here. 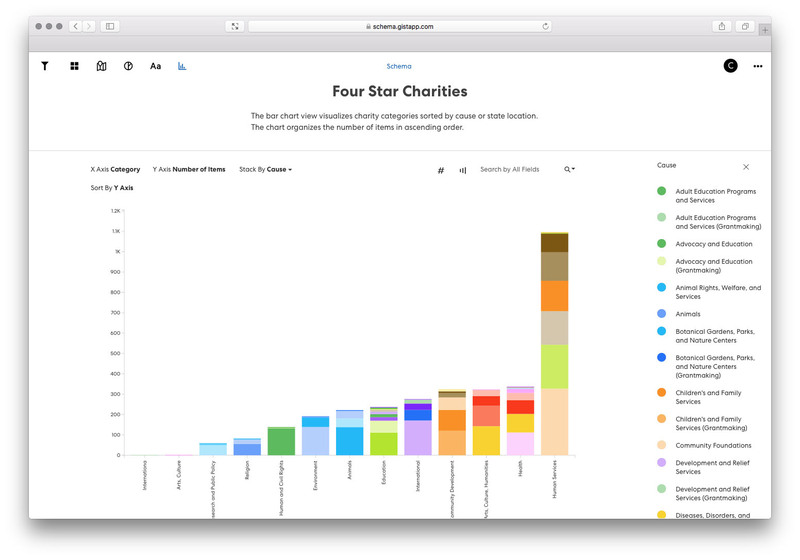 Deriving data from the Charity Navigator site, the visualization uses Gist to provide an array of views on four star rated charities. With over 3,000 non-profit organizations, the visualization curates and organizes various charity information, such as state location and aid category. The regional map view, for example, displays the charities by state location on a map of the United States. A gradient color scheme highlights the individual states that have the most number of four star organizations. On the map, California is the darkest colored state and has the most associated charities by location at 424 items. Hovering over each state on the regional map shows a preview of the number of nonprofits. 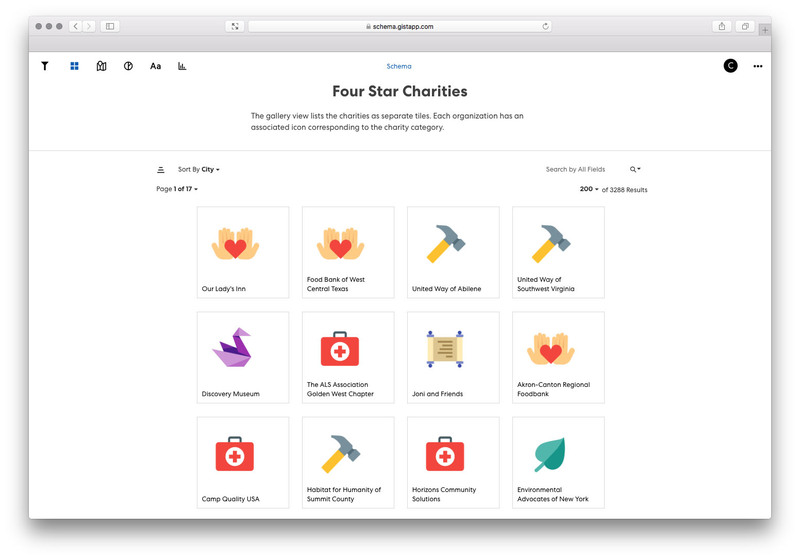 With the bar chart view, charity categories can be sorted by cause or regional location. The higher a bar is in the diagram, the more charities it is associated with, relative to other categories. A related category, such as “Arts, Culture, and Humanities” can be further broken down by causes like “Performing Arts” and “Museums”. 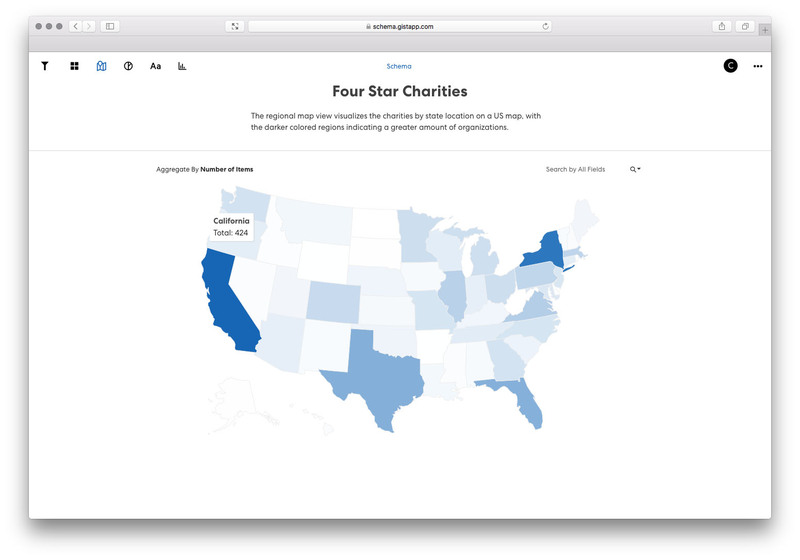 The Charity Navigator visualization aims to empower and encourage informed giving using real world data. Be sure to check out all the features of the visualization or use Gist to create your own data-driven story.